:: steph chows ::: Pickle me spicy! This was my first try at pickling, have you pickled things or are you more of a sweet lover? 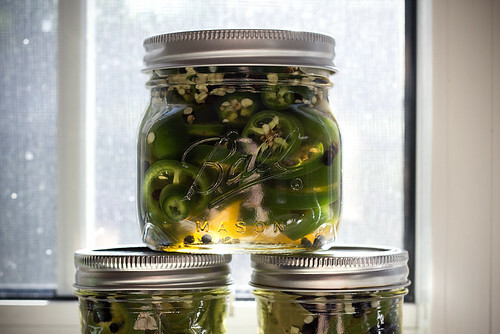 I'm seriously addicted to pickled jalepenos (my husband and i can go through a jar in a week). Thanks so much for posting this recipe, it will be my first attempt at pickling too! I was so excited too! My husband was so skeptical of them and didn't want to try them, once he finally did he asked how many jars I had left since he knew I gave some away already LOL he's already asking me to stock up and make more! I did some quick and easy pickling using a Cooking Light recipe (used squash and zucchini) and now I want to do more! Loved it! The way the light shines through those jars is just stunning! 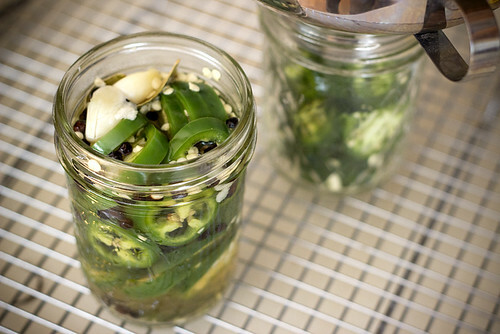 I'm rather timid of palate as far as spicy food goes, so I've never tried pickling jalapenos before. However, doled out in small doses at a time, they sound great! I haven't tried pickling them yet (I've only done hot pepper jam) but I definitely learned my lesson about the seeds too, hehe! Yay for pickles!